At the UW, instructors may use Panopto to record their courses so students can review the material later. We strongly encourage instructors to take advantage of this easy way to support student learning. Panopto offers many features to make viewing recordings easier. Read on to learn more and follow links to Panopto documentation of key viewing features. 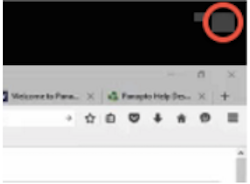 Access full Panopto functionality: When viewing a recording embedded in Canvas or a web page, click to play, and then in the upper-right corner of the recording, select the large grey rectangle. This will open the recording in Panopto. Viewing Overview: Learn more about viewing recordings. Search: Use keywords to search text, including bookmarks, notes and PowerPoint slides. Viewing controls: Adjust volume, review previous 10 seconds, navigate to relevant content and change viewing speed. Bookmarks: Bookmark a specific time in a recording and come back to it later. Discussions: Discuss a recording, leave public comments or ask questions. Notes: Make time-stamped notes while viewing a recording. By default, your notes are private but you can share them publicly with anyone who has access to the recording. Mobile Apps: View recordings on mobile devices. Note: Panopto apps have limited functionality and may be more difficult to navigate. The UW address is https://uw.hosted.panopto.com. Canvas: Using the Canvas app to view Panopto recordings will offer a choice to open recordings in the Panopto app or view them in a browser. View in browser offers varied scalability for recordings depending on the locations (navigation tab or embedded). Find recordings: Access recordings several ways. They can be found in the navigation under Panopto Recordings (if available), contained in Canvas Modules, embedded in Canvas Pages, or made available using links. Check with your instructor to see if they are using Panopto and where the recordings are located. Contact your instructor if the recording isn’t available, you get a message telling you to request access, you can’t find the recording in Canvas, or if the link appears to be broken. For playback, loading or audio issues, if the site is down or if you have other questions, contact UW-IT at help@uw.edu or 206.221.5000 select option 3 then option 1 and specify Panopto. Captioning: To request captioning for students who need accommodations send an email to Disability Resources for Students: drscc@uw.edu. Video tutorial: Learn more by watching Panopto’s Viewing a Session video.